We’re closing on 40 years since William Warner, a New York-New Jersey boy, awakened us Chesapeake natives to the fascinating commerce, ecology and sociology attached to Callinectes sapidus, that beautiful swimmer, the blue crab. Perhaps it took an outsider to appreciate what us born-heres grew up with. Warner won a 1977 Pulitzer Prize for General Nonfiction for his efforts, and put the Chesapeake on the map in a way that should endure as long as crab feasts and crabcakes. Tom Horton, Sandy Cannon, and David Harp, the documentary team. Bay Journal News Service. With filmmaker Sandy Cannon-Brown and photographer David Harp, I’m roaming the Chesapeake this year, making an hour-long documentary that takes inspiration from my late friend Willy Warner, and looks at what’s happened to crabs and crabbers, as well as what’s next. I knew before starting that we’d have to document that we understand far more about the science and management of Callinectes than in 1976, when the book was published; as well as note that there are fewer crabs—and crabbers—around to manage. So, if we’ve gotten so smart, then why aren’t we richer in crabs? I’m a little optimistic here. 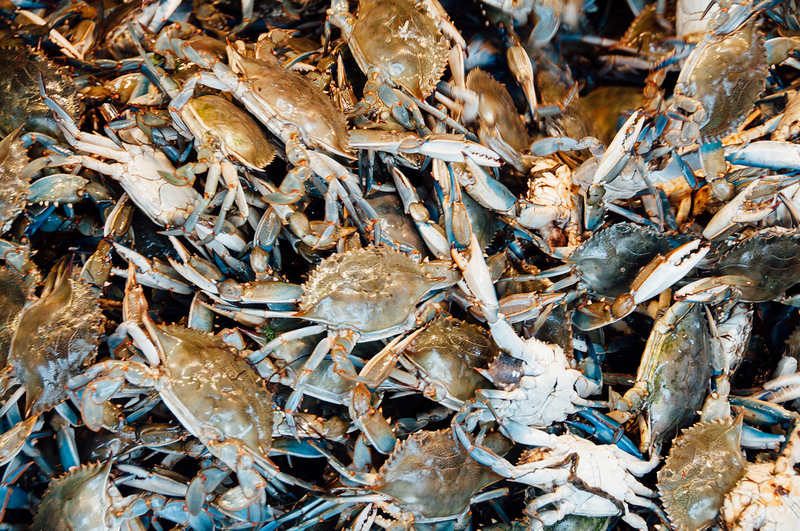 Crabs, even in today’s reduced numbers, are still the Bay’s last great fishery. Both Maryland and Virginia have recently put the tools in place and have the science to harvest crabs sustainably. With a little vision and some consensus among managers and crabbers, we could have a world-class, wild fishery, something most of the world’s waters are headed away from. Managing fishing pressure is a big part of the equation; but restoring aquatic quality—clean water and good habitats—is a big part, too; and here I’m less optimistic. “We got a dirty workplace, simple as that,” said Ken Smith, president of the Virginia Waterman’s Association. And it’s not just the big, obvious sources of “dirt”: the farmland everywhere leaking manure and other fertilizers, the stormwater and sewage and septic tanks force-feeding the bay with nutrients. It’s also what we continue doing to the Bay’s thousands of miles of edges, those most productive merges of land and shallows and mudflats and wetlands where so much of the estuary’s life, including us, wants to hang out. I got a stark comparison of the “bay we need” versus the “bay we’re creating” the other day on a crab trawl survey with Anson, “Tuck” Hines, director of the Smithsonian Environmental Research Center (SERC). We were in the Rhode River, a shallow sub-estuary of the Chesapeake tucked into the shoreline just south of Annapolis. You’ll find a few trot-liners working here, but places like the Rhode are mainly critical nurseries for juvenile crabs. Hines has been studying them since 1979, when he tied ping pong balls to their flippers with monofilament to track their movements. These days he’s using telemetry and implanted electrodes that afford SERC scientists exquisitely detailed views into the lives of young crabs, down to how many bites it takes them to finish off a small clam (about 100). Crabs in the Bay and the Rhode were considerably more abundant when Hines began his trawls decades ago. Interestingly, the submerged grass beds, well-documented baywide as favored habitats for feeding and molting little crabs, were long gone even then, victims of water quality that had also plummeted. Hines only learned of the grasses from talking to “old timers” who could recall the clearer waters of the 1950s and 1960s. But the little crabs adapted, and thrived, Hines found. They used the woody debris that fell into the waters from the Rhode’s forested edges for shelter when molting. They took refuge from predators, including bigger crabs, by inhabiting the very shallowest waters and wetlands next to land. To our left and south as we trawled that day, the Rhode River shore stretched for miles, thickly green and marshy and forested. SERC protects some 16 miles of edges on the lands it owns. To our right and north lay walls of rock, protecting neat lawns and McMansions from erosion. No woody debris there. No protective shallows either, as wave energy deflecting downward off seawalls deepens the near-shore. I kayak all over the Chesapeake, and every time I’m out I see more shoreline armoring, dozens of miles a year in both Maryland and Virginia—not just private owners either. Governments lay down a lot of armor, from Aberdeen to Norfolk. I can’t recall when I’ve seen anyone taking their shoreline back to forest in a major way. Tom Horton covered the Bay for 33 years for the Baltimore Sun and is author of six books about the Chesapeake. Distributed by Bay Journal News Service. In a new report, the Federation for American Immigration Reform is blaming the overpopulation of the Chesapeake Bay watershed, and the resulting environmental destruction, on the influx of immigrants coming into the area. But bay advocates scoffed at the notion that growth and immigration are to blame for the area’s environmental problems.